There has been a fair amount of buzz lately (examples here, here, here, here) about “food insecurity” in the U.S. According to the Reuters headline, one in seven Americans is short of food. In looking into the data, what has surprised us is how different the meaning of “hunger” is when we’re talking about the U.S. vs. the developing world. 3.5% are “wasted” (weight-for-age even more severely below normal, such that only 0.13% of children should be “wasted” in a normal distribution). These are indicators of severe, long-term consequences of constant undernutrition for young children. The report’s summary specifies that food insecurity is usually temporary as opposed to chronic (pg 9) and that children are usually protected from food insecurity even in food-insecure households (pg 6-7). These data imply that anything approaching the sort of hunger measured in the developing world is practically nonexistent in the U.S. Note in particular the difference regarding children. In the developing world, as shown above, severe child hunger is rampant. In the U.S., even in “food insecure” families, it’s extraordinarily rare for children to go hungry even temporarily. And indeed, World Bank data estimates that 1.3% of U.S. children under 5 are “underweight” – less than the 2.3% that would be expected in a fully normal distribution. 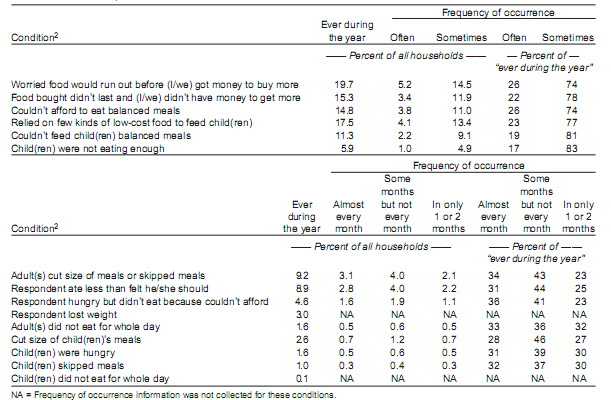 Also note that the USDA report estimates costs for different levels of “food plans” (pg 55), and that its “Thrifty” plan – the cheapest – ranges from $21-$40 per week ($3-$6 per day) depending on age. In the developing world, meanwhile, over 2.5 billion people are estimated to live on less than US$2.50 a day total. We have no intention of trivializing the situation of those in poverty in the U.S. But for a donor making choices, it can be stunning to see what a different meaning “hunger” takes on when applied at home vs. abroad. Do you value the lives of Americans so much more that you’d rather help people with the second kind of hunger than people with the first? Your post implies that you are surprised Americans would choose to donate locally, where their donations have less of an objective impact. But this is real-world economics – people are not rational, they are not objective. There is a much greater psychological impact of seeing a child who looks like, lives near, and could be friends with your own child “going hungry” (like the ones here in Oregon who get no food on the weekends without their school lunches), than hearing statistics about children who live far away, look different, and have always been portrayed as poor, hungry, and living in terrible conditions. We are acclimatized to seeing African children as starving and diseased. We are shocked to see that among our own communities. Until you can humanize, individualize, and familiarize the foreign aid recipient, you will continue to see this discrepancy. Tzipporah, for many donors, I believe it is more complicated than “rational” or “not rational.” For example, I personally would prefer to help people whose lives I can more easily identify with, all else being equal – but looking into these issues, I’ve become surprised with how unequal all else is. I believe that other groups are better suited than GiveWell to “humanizing, individualizing, and familiarizing the foreign aid recipient” (something I agree has value). We see our role as providing factual context, which isn’t the only relevant consideration, but may be enough to change many donors’ minds.